Dansko's flagship classic for all-day comfort, support and unmistakable style is now available with more room! High quality leather upper follows the natural contours of the foot. Box leather is ideal for the workplace environments with wet, acidic or greasy conditions. It has a smooth, clean finish with the natural irregularities removed. It is the easiest leather to maintain, and can be wiped clean with soap and water. Instep collar is generously padded. Roomy Thermoplastic toe box provides durable reinforcement and toe protection while allowing toes to move comfortably. Nonallergenic vegetable tanned leather sockliner wrapped around synthetic foam absorbs and evaporates perspiration. Protective Polyethylene heel counter allows the heel to move up and down when walking. Also provides lateral stability and acts as a natural shoe horn. PVC inner frame provides stability and reduces torque and pronation. Polyurethane outsole provides shock absorption and flexibility, withstands surfaces of extreme heat and cold, and protects feet, legs and back during long hours of standing or walking. Rocker bottom propels the foot forward when walking. 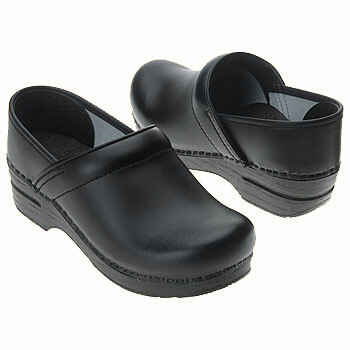 Dansko Stapled clog outsoles are designed to be suitably slip resistant in workplace environments where excesses of vegetable oils and animal fats are present. Slip resistant tests have been carried out by SATRA, the world's leading research and technology organization for the footwear industry. Dansko's Stapled Clog Collection proudly carries the Seal of Acceptance from the American Podiatric Medical Association. 1 3/4" heel. 1/2" platform. I was nervous ordering shoes that I am not familiar with on the internet...however when I received(the shipping was incredibly fast!) the shoes they fit perfectly. The description of the shoe helped tremendously and I even watch the video before buying, because I wanted to be sure. However if they did not fit, it seemed like the return would be very easy. Thanks for my first pair of Danskos(which I should have gotten years ago)!!! It changed every thing. My posture, my feet feel incredible at work, and I am not tired at the end of the day! I am going to purchase a few more pair thats how much I enjoy them! Great pair of shoes!! They're comfortable and fit perfectly.